When I go grocery shopping, I can't resist buying a box of our preferred cereal when it's on sale. Even if we have a couple of unopened boxes of Cheerios, if No Frills has it in their flyer, I'll pick up another box. This is the top of our refrigerator right now. The cereal comes in faster than we can eat it. Too bad you don't have kids. I'm sure there's a joke in there somewhere, but I'm afraid it's gone right over my head. A few years ago, I gave the kids a 3 grams of sugar rule when it comes to cereal. Essentially, they could have any cereal they wanted so long as the label said there was 3 grams of sugar or less per cup. All cereals I buy fall into that category. Both James and Michelle prefer Cheerios and Rice Krispies. That's their cereal. I love Special K, so that's for me. Both Monica and I enjoy the Blue Menu Bran Flakes, so that's for us. I'm sure baby Jarvis will be tapping into the Cheerios before the year is over. Kids are hoovers and should have taken care of your serial cereal shopping problems. My favourite cereal now is called Edge with Protein cereal. It has flakes of stuff mixed with almond clusters. It's awesome. Fibre 1 or spoon sized shredded wheat with bran is the way to go. 0 g. of sugar per serving. I currently have 4 full boxes of Fibre 1 on my shelf as it was on sale at Metro last week! Edge with protein is full of sugar (11 g. per serving). But my kids love it. Cold pizza & flat beer, the breakfast of champions. Blue Menu Omega-3 almond vanilla granola or PC Raisin Bran (the PC flakes are better than Kelloggs). When no one is looking, then it's my granddaughter's Quaker cookies and cream instant oatmeal. Hey, I buy the groceries, so I'm allowed! You need something nice and sugary in their like Mini Wheats or Lucky Charms! Yeah I'm all about sugary serial too. Guess it's probably a good thing I don't buy it very often then. But when I do it's usually fruit loops, Lucky Charms, Mini Wheats, Sugar Crisp or Cinnamon Toast Crunch. I also don't mind Cherios or Frosted Flakes. used to love Honeycombs till they went and changed the formula and ingredients about 10 years ago or whenever they changed it. "Special K"? What's the point? @Toronto Mike: If you took the time to price match, especially at No Frills you wouldn't have to buy cereal only when it's on deal there. Thus you could eliminate a slight case of cereal hoarding. 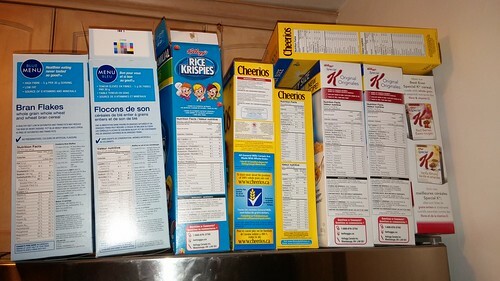 Might be time to close the lids on two of those boxes of cereal in the picture, you wouldn't want them getting stale. All open bags are clipped shut with my handy Ikea fasteners. The good part is I only eat cereal once a week at most. Usually i make a yogurt and fruit smoothie . I loved Shreddies as a kid. I gave it and Raisin Bran up when I started reading the labels. But, the President's Choice Blue Menu Bran Flakes taste like Shreddies to me, but with much better contents. It never goes on sale, and not every No Frills carry it, but my wife and I both love it. Does Edge with Protein really have that much sugar. I love that stuff. I don't pour milk on it though. I hate soggy cereal. why do you keep them on top of the fridge - have you no cupboards? There's insufficient cupboard space for the cereal boxes, so they live on the fridge. you could shave off .2 grams of sugar if you go with skim. And even more if I go with water. I honestly can't tell a difference between 2% and 1%, so we buy 1%. But, I can tell the difference between 1% and skim, and no sir, I don't like it. My sugar limit on cereal is 6g and the new Cheerios Multigrain with Ancient Grains just makes it. I use unsweetened Almond Milk and it is fantastic! We weren't allowed to have Count Chocula, or Lucky Charms or any of that stuff with marshmallows, etc. in it. To get around that, we'd sprinkle white sugar all over whatever cereal we had. By the time we'd get to to bottom of the bowl, all that was left was super sweet milk, and probably two spoonfuls of sodden sugar that we'd happily eat. Absolutely gross when I think of it now. I'm sure we would have been better off eating Count Chocula. Our cereal boxes were always bowed and bent out of shape since whoever opened the box first would jam their little arms up to the elbow in it retrieving whatever crappy prize was included. Skim milk back in the day was indeed watery and gross and had a bluish tinge to it. Also, my mum went through a phase where she would buy tons of it and freeze it. Often after thawing, the milk would weirdly separate so little white dots would be stuck to your glass after drinking it. I hated having friends over during that phase. Skim milk is much, much better now. Yeah we usually buy 1 or 2%. Skim milk is just nasty! Those clips are ok but, ants can STILL get by those. I put ALL of my dry goods in plastic/Tupperware. Keeps things fresh and beasties out. Nobody in my house reads the box anymore. Blue Menu 30% Fruit & Nut. with a handful of frozen blueberries, sprinkle of ground cinnamon & ground flax seed, skim milk. Put that together the night before, leave in fridge overnight. Recently tries the Special K Low Fat Granola, the texture and taste was... manufactured. Always wanted Honeycomb when I was a kid, but never got it. "They're too big, you only get six of the damn things in the box" - Mom. You should try harvest crunch light & crisp honey nut. Well, I drink unsweetened almond milk. I don't pour it onto cereal though. I hate soggy cereal and I hate porridge because it was forced down my throat when I was in boarding school. Anyway, there will be lots of Edge with Protein at my World Series party and lots of sushi as well. Anyway, there will be lots of Edge with Protein at my World Series party and lots of sushi as well. So what's wrong with sushi. Oh well, not like anyone is forced to come to my World Series party. There will be one though. Cherios? No, we're not having cherios. We are having edge with protein and we're having sushi, lots of it. Now you ask what else we'll be having? Well, haven't decided yet. It won't be until October anyway. It will be after the Orioles win the World Series. It's to celebrate. How big a crowd are you expecting for your Baltimore Orioles victory party here in Toronto? I didn't even think about how big of a crowd. I have no idea. Has anyone ever tried Janet and Greta Podleski's granola recipe? Made with peanut butter...so good! Found something new at Superstore today: Porridge Oats by a Canadian company called Rogers. Contains steel cut oats, large flake oats, oat bran, wheat bran and flaxseed. 0 grams sugars and 6 g fibre. Going to give it a try.